Many people don’t work on a bank holiday but for Anthony Sargent Monday will be his last day in charge at Sage Gateshead before he hands over to successor Abigail Pogson. After attending a concert by the Tim Garland Quartet in Hall Two, he will leave the building for the last time as general director. When he next enters, as he promises he will, it will be as a ticket buying member of the public. Ahead of his last day he reflected on triumphs (many) and regrets (far fewer) – and also issued a plea ahead of the general election. He believed that while the appointment of Abigail Pogson, “very properly”, sent out a message about change, in 10 years’ time the values of the Sage and its relationship with the community would remain the same. The pair have overlapped for the past four months, representing a soft handover from Anthony – appointed 15 years ago when Sage Gateshead was still a plan called ‘regional music centre’ – to the former chief executive of London-based Spitalfields Music. So what challenges – and indeed pleasures – await the new boss? “Money for everybody is a challenge at the moment,” said Anthony. “People focus on the headline figures such as the Arts Council’s grant and sometimes the local authority’s grant but it has actually been much more insidious than that. “The complete demolition of the RDAs (regional development agencies) so soon after the coalition government came to power was not good news in this region. “Some (RDAs) were good, some less good. Some had a sense of the economic value to be gained from investing in culture and some didn’t. This one (One North East) really did. Local authority and voluntary sector cuts had brought further pressures. The last government, said Anthony, while stressing that he regarded core grants as investment, “completely failed to spot the consequences of this perfect storm of public sector shrinkage” which had hampered arts organisations’ ability to make a difference in many areas. Successful programmes run by Sage Gateshead included ones for young people with “often unimaginably damaged lives” and dementia sufferers. They had been considered big risks. The former, in The Arches behind the Sage, had engaged the young people in various aspects of urban culture with numeracy, literacy and employment skills “layered in”. Anthony said one third of Sage Gateshead’s 463 employees – which includes members of Royal Northern Sinfonia – was involved in education. The money has not all gone, Abigail Pogson will be relieved to know. “She’ll be very focused on the money but she’s not staring into an abyss,” said Anthony. “We have a five-year business plan which shows a small surplus every year which we invest in the music. “This isn’t about survival because I don’t think that’s in any doubt at all. “But Abigail will want to find ways of harvesting additional resources to do exciting things and she’ll bring a fresh mind to that which is good. Of the Sage’s first endowment fund of £12m, far exceeding expectations, 92% had come from the region. “Our second endowment is aiming to raise £6m by June 4 and we’re optimistic about doing it. Anthony said he and his team had slightly altered the balance of what happens at Sage, programming more nights guaranteed to deliver a strong revenue stream. But he said – another challenge to his successor – that an arts organisation, while it had to stay solvent and behave responsibly, “at the end of the day if you get that right and do boring art, you won’t last a week”. Anthony remembered the euphoria surrounding the Sage’s 10th anniversary weekend, the programming over four years of Wagner’s Ring Cycle with Opera North – returning in 2016 when all four operas will be performed in a week – and, just recently, Sting’s concert performances of The Last Ship. He produced a list of more than 100 new musical works commissioned or premiered over the past decade. “We have really raised the bar in people’s sense of what is possible here, and so have many of the other arts organisations – Baltic has certainly done it. “The thing I feel proudest of handing over to Abigail is that, in general, people who care about arts and culture take for granted that things are possible in their community that in 2004 would have seemed like Utopian fantasies. “If in one sense we take fewer risks now, it’s because things that would have been risks once no longer are. “Sting gave those concert performances of The Last Ship and they were the first anywhere in the world. But people expect that. 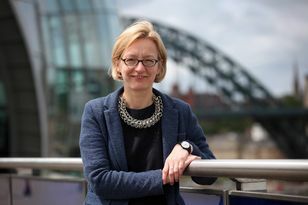 Anthony said the close cooperation between the major cultural institutions on Tyneside – the informal cluster known as NGCV (Newcastle Gateshead Cultural Venues) – was unique and “like family, but not in a Mafiosi kind of way”. It showed how all they all believed in the contribution culture could make to regenerating communities, “rebuilding their confidence, ambition and pride”. He hoped the incoming government would share that view and take it seriously. As for what Anthony Sargent plans to do next, he said he had three irons in the fire, one in the UK and two overseas – one to do with partnerships, one “quite complicated” and the third “an insane, maybe unachievable challenge”. In the meantime, he is happy to remain on Tyneside living in the house whose view takes in the curvaceously contoured building that has provided “really precious memories” – and, from time to time, joining the punters at the ticket desk.